At no. 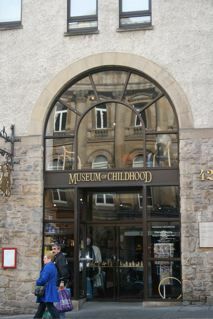 42 Canongate, along the Royal Mile in Edinburgh, tucked behind a little gift shop is the Museum of Childhood. 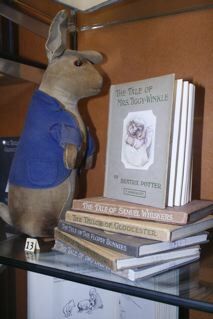 Established by Edinburgh Counsilor Parick Murray In 1955, the museum is a treasure trove of toys, books and even children’s househod items from bygone eras. 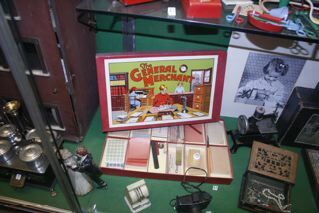 It is a beautiful walk through the history of toys and games and children…. and we were all children once! 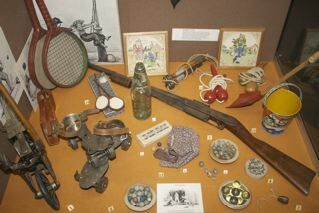 In the main ground floor gallery is a display of tricycles, a ride in plane and those old tin pedal cars, as well as children playing games like leapfrog. 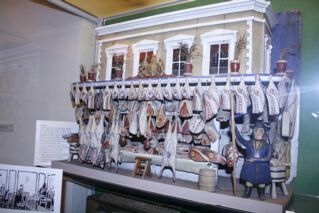 This is one of the only displays not behind glass, but is still very much hands off. 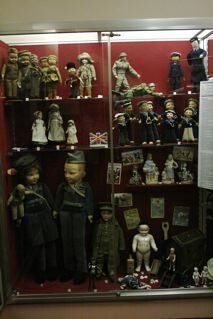 A Museum in the most traditional sense, each of the five galleries houses beautiful displays of Dolls, toy cars, train sets, miniatures, board games, books, rollerskates, puppets, skipping ropes, pop guns, meccano…. you name it! 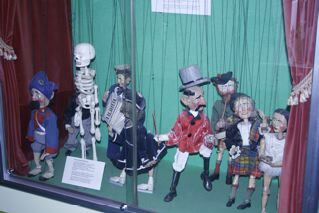 Despite the traditional displays being ‘hands off’ childen are more than welcome (expect heaps of them) and on each floor there was something for the littlies to get their hands on. The games gallery was the best. 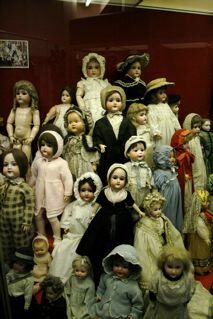 There were actual board games, lego, those little sewing kits where you thread a shoelace through holes in a plastic animal (I remember that), and those double ended dolls where you tip them upside down, their skirt flips up and…. voile’… a new doll (that too!). 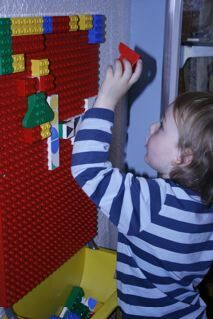 The boys loved the magnetic fishing game and the lego. Needless to say we spent a lot of time in this gallery! There were definitely issues with access. Each gallery is on a different level, meaning steps and more steps. There is a lift but it does not access every gallery. This meant we had to leave the buggy at our own risk. Having only one set of hands, meant the bag and all the jackets necessary for being outside in Edinburgh were also left. The other issue with the steps is at least one end of all the galleries has a flight of steps, so little children (especially lively toddlers) need a close eye. On my own I would have meandered through each room, taking time to read the plaques, and really enjoy the history. My time though was mainly dedicated to following (chasing?) the boys around. (which is not that different from going anywhere else really!) They weren’t really interested in the cabinets, just the toys they could play with. Despite the challenges for me, they had a great time running about and playing with other kids as well as the toys on the right side of the glass! On our way out we put a penny in a ‘spooky’ arcade game where scary faces appeared from behind miniature doors and paintings and skeletons appeared from behind the tiny chair that was raised off the ground in a ghostly way. 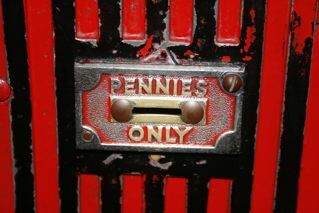 Just scary enough for a four year old, and worth a penny just because nothing costs “pennies only” anymore! I managed to navigate through the gift store without a detour to the cash register and out into the crisp Autumn air. Now…. Lets find some coffee and cake…. 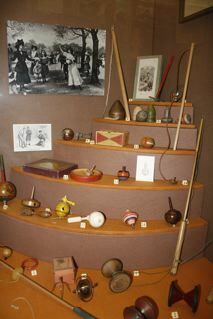 Have you played with any of these? 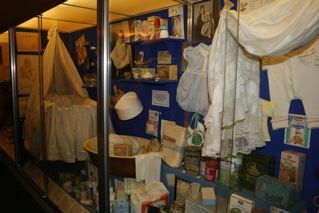 Worth a visit? Absolutely yes, If you’re walking past with some kids and a buggy laden with bags, maybe not, go another time, but definitely go! Who’s it for? 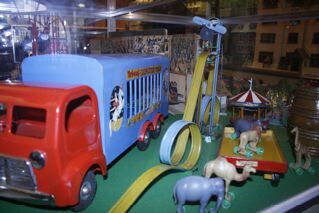 Everyone, I loved listening to some older ladies talking about their own childhoods and playing with these toys! There wasn’t very much from my own childhood, but I guess as time goes by, more will be donated. If you like this post, why not subscribe? 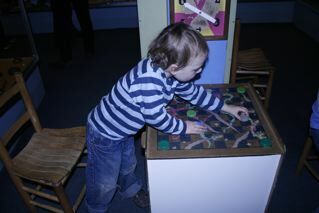 This entry was posted in Days Out and tagged Days Out, Edinburgh, Free stuff, Museums, The Museum of Childhood. Bookmark the permalink.